This article is about a town in south of England. For other uses, see Bournemouth (disambiguation). Bournemouth /ˈbɔːrnməθ/ ( listen) is a large coastal resort town on the south coast of England, east of the 96-mile-long (155 km) Jurassic Coast, a World Heritage Site. At the 2011 census, the town had a population of 183,491, making it the largest in Dorset. With Poole to the west and Christchurch in the east, Bournemouth is part of the South East Dorset conurbation, which has a population of 465,000. The town centre has notable Victorian architecture and the 202-foot (62 m) spire of St Peter's Church, one of three Grade 1 listed churches in the borough, is a local landmark. Bournemouth's location has made it a popular destination for tourists, attracting over five million visitors annually with its beaches and popular nightlife. The town is also a regional centre of business, home of the Bournemouth International Centre or BIC, and a financial sector that is worth more than £1,000 million in gross value added. The first mention of Bournemouth comes in the Christchurch cartulary of 1406, where a monk describes how a large fish ("uni magno piscis"), 18 feet (5.5 metres) long, was washed up at "La Bournemothe" in October of that year and taken to the Manor of Wick; six days later, a portion of the fish was collected by a canon from Christchurch Priory and taken away as tithe. "La Bournemowthe", however, was purely a geographic reference to the uninhabited area around the mouth of the small river which, in turn, drained the heathland between the towns of Poole and Christchurch. The word bourne, meaning a small stream, is a derivative of burna, old English for a brook. From the latter half of the 16th century "Bourne Mouth" seems to be preferred, being recorded as such in surveys and reports of the period, but this appears to have been shortened to "Bourne" after the area had started to develop. A travel guide published in 1831 calls the place "Bourne Cliffe" or "Tregonwell's Bourne" after its founder. The Spas of England, published ten years later, calls it simply "Bourne" as does an 1838 edition of the Hampshire Advertiser. In the late 19th century "Bournemouth" became predominant, although its two-word form appears to have remained in use up until at least the early 20th century, turning up on a 1909 ordnance map. Section of a 1759 map of Hampshire by Isaac Taylor, showing the Manor of Christchurch and the area around the Bourne chine. In the 12th century the region around the mouth of the River Bourne was part of the Hundred of Holdenhurst. The hundred later became the Liberty of Westover when it was extended to include the settlements of North Ashley, Muscliff, Muccleshell, Throop, Iford, Pokesdown, Tuckton and Wick, and incorporated into the Manor of Christchurch. Although the Dorset and Hampshire region surrounding it had been the site of human settlement for thousands of years, Westover was largely a remote and barren heathland before 1800. In 1574 the Earl of Southampton noted that the area was "Devoid of all habitation", and as late as 1795 the Duke of Rutland recorded that "... on this barren and uncultivated heath there was not a human to direct us". In the late 19th and early 20th centuries the Borough of Bournemouth would grow to encompass a number of ancient settlements along the River Stour, including Longham where a skull thought to be 5,500 years old was found in 1932. Bronze Age burials near Moordown, and the discovery of Iron Age pottery on the East Cliff in 1969, suggest there may have been settlements there during that period. Hengistbury Head, added to the borough in 1932, was the site of a much older Palaeolithic encampment. During the latter half of the 16th century James Blount, 6th Baron Mountjoy, began mining for alum in the area, and at one time part of the heath was used for hunting, although by the late 18th century little evidence of either event remained. No-one lived at the mouth of the Bourne river and the only regular visitors to the area before the 19th century were a few fishermen, turf cutters and gangs of smugglers. Prior to the Christchurch Inclosures Act 1802, more than 70% of the Westover area was common land. The act, together with the Inclosure Commissioners' Award of 1805, transferred 5000 acres into the hands of five private owners, including James Harris, 1st Earl of Malmesbury, and Sir George Ivison Tapps. In 1809 the Tapps Arms public house appeared on the heath. A few years later, in 1812, the first official residents, retired army officer Lewis Tregonwell and his wife, moved into their new home built on land purchased from Tapps. The area was well known to Tregonwell who, during the Napoleonic wars, spent much of his time searching the heath and coastline for French invaders and smugglers. Anticipating that people would come to the area to indulge in the newly fashionable pastime of sea-bathing, an activity with perceived health benefits, Tregonwell built a series of villas on his land between 1816 and 1822, which he hoped to let out. The common belief that pine-scented air was good for lung conditions, and in particular tuberculosis, prompted Tregonwell and Tapps to plant hundreds of pine trees. These early attempts to promote the town as a health resort meant that by the time Tregonwell died in 1832, Bournemouth had grown into a small community with a scattering of houses, villas and cottages. The town would ultimately grow up around the scattered pines and tree-lined walk to the beach, later to become known as the Invalids' Walk. After the death of Tapps in 1835, his son Sir George William Tapps-Gervis inherited his father's estate. He hired the young local architect Benjamin Ferrey to develop the coastal area on the east side of the stream. 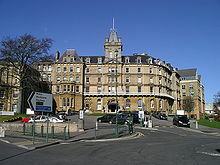 Bournemouth's first hotel, later to become part of the Royal Bath Hotel, opened in 1838 and is one of the few buildings designed by Ferrey still standing. Bournemouth grew at a faster rate as Tapps-Gervis began developing the area similarly to the south coast resorts of Weymouth and Brighton. Despite enormous investment, the town's share of the market remained modest. In 1841 Tapps-Gervis invited the physician and writer Augustus Granville to stay. Granville was the author of The Spas of England, which described health resorts around the country, and as a result of his visit he included a chapter on Bournemouth in the second edition of his book. The publication of the book, and the increase in visitors seeking the medicinal use of seawater and the pine-scented air, helped the town to grow and establish itself as an early tourist destination. In the 1840s Benjamin Ferrey was replaced by Decimus Burton, whose plans for Bournemouth included the construction of a garden alongside the Bourne stream, an idea first mooted by Granville. The fields south of the road crossing (later Bournemouth Square) were drained and laid out with shrubberies and walks. Many of these paths, including the Invalids' Walk, remain in the town today. A second suggestion of Granville's, a sanatorium, was completed in 1855 and greatly raised Bournemouth's profile as a place for recuperation. At a time when the most convenient way to arrive in the town was by sea, a pier was considered to be a necessity. Holdenhurst Parish Council was reluctant to find the money, and an attempt to raise funds privately in 1847 had only succeeded in financing a small 100 feet (30 m) jetty. The Bournemouth Improvement Act of 1856 granted greater financial autonomy to the town and a pier was approved that year. A number of wooden structures were built before an 838 feet (255 m) cast iron design by Eugenius Birch was completed in 1880. Under the Act, a board of 13 Commissioners was established to build and organise the expanding infrastructure of the town, such as paving, sewers, drainage, street lighting and street cleaning. The arrival of the railways in 1870 precipitated a massive growth in seaside and summer visitors to the town, especially from the Midlands and London. In 1880 the town had a population of 17,000, but by 1900, when railway connections to Bournemouth were at their most developed, the town's population had risen to 60,000 and it had become a favourite location for visiting artists and writers. The town was improved greatly during this period through the efforts of Sir Merton Russell-Cotes, the town's mayor and a local philanthropist, who helped to establish the town's first library and museum. The Russell-Cotes Art Gallery & Museum was housed in his mansion, and after his death it was given to the town. 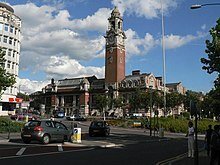 Bournemouth became a municipal borough in 1890 and a county borough in 1900. As Bournemouth's growth increased in the early 20th century, the town centre spawned theatres, cafés, two art deco cinemas and more hotels. Other new buildings included the war memorial in 1921 and the Bournemouth Pavilion, the town's concert hall and grand theatre, finished in 1925. The town escaped heavy bombing during the Second World War, but the sea front incurred great damage when it was fortified against invasion. The cast iron lampposts and benches along the front were removed and melted down for munitions, as was much of the superstructure from both Bournemouth and Boscombe piers before they were breached to prevent their use by enemy ships. The large amounts of barbed wire and anti-tank obstacles along the beach, and the mines at the foot of the chines, took two years to remove when peace was finally achieved. In 1993, the IRA orchestrated a terrorist attack in the town centre. The only injuries sustained were minor ones but over £1 million in damage was caused. The Waterfront complex, which was intended to hold an IMAX cinema, was constructed on the seafront in 1998. The 19-metre-high (62-foot) concrete and smoked glass building featured a wavy roof design, but was despised by residents and visitors alike because it blocked views of the bay and the Isle of Purbeck. In 2005 it was voted the most hated building in England in a 10,000-person poll conducted by the Channel 4 programme Demolition, and was pulled down in spring 2013. The site is now used as an outdoor event arena. The council has recently completed a larger redevelopment of the site and adjoining council land. In 2012 Bournemouth was unsuccessful in its bid for city status, losing out to Chelmsford in competition with 26 other towns to commemorate Queen Elizabeth II's Diamond Jubilee. Historically Bournemouth was part of Hampshire, with neighbouring Poole, just to the west of the border, in Dorset. At the time of the 1974 local government re-organisation, it was considered desirable that the whole of the Poole/Bournemouth urban area should be part of the same county. Bournemouth therefore became part of the non-metropolitan county of Dorset on 1 April 1974. On 1 April 1997, Bournemouth became a unitary authority, independent from Dorset County Council. 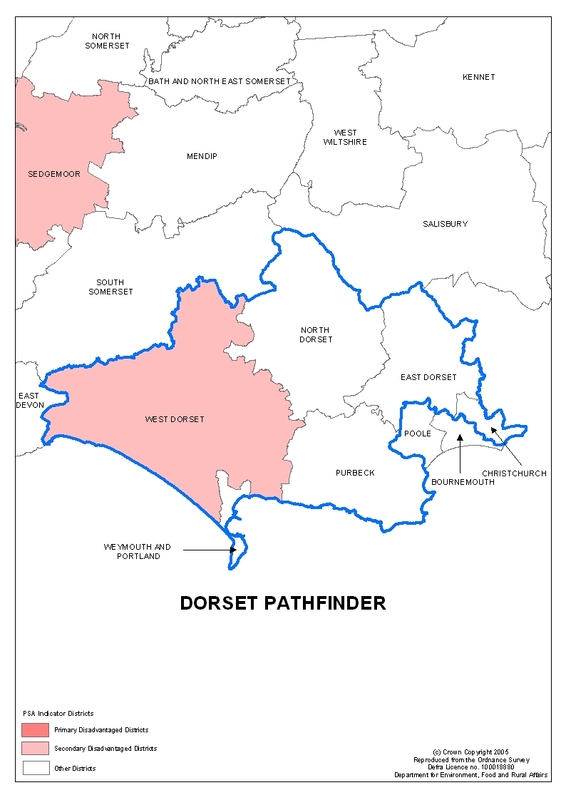 For the purposes of the Lieutenancy it remains part of the ceremonial county of Dorset. For local elections the district is divided into 18 wards, and the Bournemouth Borough Council is elected every four years. In the 2011 local elections the Conservatives held overall control, winning 45 of the available 51 seats. The Council elects a mayor and deputy mayor annually. The Mayor of Bournemouth for 2018-19 is Councillor Derek Borthwick. Bournemouth is represented by two parliamentary constituencies in the House of Commons; Bournemouth East and Bournemouth West. In the 2017 general election, the former was held for the Conservatives by Tobias Elwood with 51.9% of the vote, while the latter was also held for the Conservatives by Connor Burns with 53.5%. However, the seats saw some of the largest increases in Labour vote share in the country, with increases of over 18% in each. Bournemouth is about 94 miles (151 km) southwest of London. The borough borders the neighbouring boroughs of Poole and Christchurch to the west and east respectively and the East Dorset District to the north. Poole Bay lies to the South. The River Stour forms a natural boundary to the north and east, terminating at Christchurch Harbour; while the River Bourne rises in Poole and flows through the middle of Bournemouth town centre, into the English Channel. The towns of Poole, Bournemouth and Christchurch form the South East Dorset conurbation with a combined population of over 400,000. Bournemouth is both a retail and commercial centre. Areas within Bournemouth include: Boscombe, Kinson, Southbourne, Springbourne, Throop, Westbourne and Winton. The area's geology has little variety, comprising almost entirely of Eocene clays which, prior to urbanisation, supported a heathland environment. Patches of the original heath still remain, notably Turbary Common, a 36-hectare (89-acre; 0.14 sq mi; 0.36 km2) site, much of which is designated a Site of Special Scientific Interest. This heathland habitat is home to all six species of native reptile, the Dartford warbler and some important flora such as sundew and bog asphodel. Small populations of Exmoor pony and Shetland cattle help to maintain the area. Bournemouth is directly north of Old Harry Rocks, the easternmost end of the Jurassic Coast, 96 miles (155 km) of coastline designated a World Heritage Site in 2001. Bournemouth's own coastline stretches from Sandbanks to Christchurch Harbour and comprises mainly sandy beaches backed by gravel and sandy clay cliffs. These cliffs are cut by a number of chines which provide natural access to the shore. At the easternmost point lies Hengistbury Head, a narrow peninsula that forms the southern shore of Christchurch Harbour. It is a local nature reserve and the site of a Bronze Age settlement. Bournemouth lies at the centre of a green belt region that extends into the wider surrounding counties. It is in place to reduce urban sprawl, prevent the towns in the South East Dorset conurbation from further convergence, protect the identity of outlying communities, and preserve nearby countryside. This is achieved by restricting inappropriate development within the designated areas, and imposing stricter conditions on permitted building. Bournemouth has small areas of green belt within its district to the north and east, mostly along the fringes of the shared border with the Christchurch and East Dorset districts. These cover landscape features and greenfield facilities including the River Stour, Stour Valley Way, Millhams Mead and Stour Valley nature reserves and arboretum, Hengistbury Head, and the small communities of Throop and Holdenhurst. The 2011 census records the population of Bournemouth as 183,491, comprising 91,386 males and 92,105 females, which equates to 49.8% and 50.2% of the population respectively. The mean average age of all persons is 40 years. With 4,000 residents per square kilometre, Bournemouth has the highest population density of any authority in the South-West region, and is the eighth most populated. Much of the population, 83.8%, describe their ethnicity as 'white British' while other white groups account for a further 8.1%. Asian groups; Indian, Pakistani, Bangladeshi, Chinese and other Asian, make up 3.9%. Black British, black African, black Caribbean and other black groups form 1.0% of the population, Those of a mixed race make up 2.3% of the population, and 0.9% are from other ethnic groups. Christians made up 57.1% of the population but 30% of residents said they had no religion and 7.8% declined to say whether they were religious or not. Muslims were 1.8%, Buddhists, Hindus and Jews each had a 0.7% share, Sikhs were 0.1%. and other religions made up 0.7%. Of all Bournemouth residents aged 16 or over, 19.1% had no qualifications at all, although 35% said they had between one and four O-levels, CSEs, GCSEs or equivalent, and 36.5% have more than five O-level equivalents (grade C and above), an A-level or two to three AS-levels. Those with an NVQ level 1 comprise 8.0% of the population while 15.2% have a level 2 NVQ, a City and Guilds craft certificate, BTEC or general diploma. Just over 20% of residents had two or more A-levels, four or more AS-Levels or an advanced diploma while 15.8% possessed a degree, such as a BA or BSc or a higher degree such as an MA or PhD. An NVQ level 4 or 5, HNC, HND, higher BTEC or higher diploma, is held by 4.2% and a professional qualification is held by 13.9% of residents. An apprenticeship has been completed by 6.3% of the population while 16.9% have some other work related or vocational qualification and 8.3% hold a foreign qualification. Source: GIS / University of Portsmouth, A Vision of Britain through Time. Financial Services are crucial to the town's economy and Unisys was a major employer in the industry. Similarly to the rest of Dorset, Bournemouth's economy is primarily in the service sector, which employed 95% of the workforce in 2010. This was 10% higher than the average employment in the service sector for Great Britain and 11% higher than the South West. Of particular importance are the financial and public service sectors which through 2011 continued to show sustained growth. Compared to the rest of the country, Bournemouth performed well in these two areas but under performed in transport and communications. Tourism is also important to the local economy. In 2011, domestic and overseas visitors made more than 5.6 million trips to the town and spent over £460 million between them. The equivalent of 8,531 full-time jobs exist as a result which accounts for 15% of all employment in the town. Bournemouth seafront is one of the UK's biggest attractions with 4.5 million visitors in 2011. RNLI lifeguards provide seasonal coverage of Bournemouth's beaches. With a third of all town centre businesses in the leisure industry, Bournemouth has a booming nightlife economy and is a popular destination for stag and hen parties. These party-goers contribute £125 million a year to the economy and support 4,000 jobs. In 2010 the town was awarded a Purple Flag for providing a wide variety of night-time activities while maintaining the safety of both residents and visitors. An independent report published in 2012 indicates there has been a rise in antisocial behaviour which it attributes to the increase in nightlife. Those of working age make up approximately 65% of Bournemouth's population and of these, 74.6% are economically active although not necessarily employed within the Bournemouth area. Industry in Bournemouth employed more than 76,400 people in 2011 but not all of these were Bournemouth residents. Of those employed in Bournemouth based industries, 29.32% were employed in the public administration, education and health sector. This compares favourably with Dorset, the South-West region, and the country as a whole, as do the other large sectors; distribution, hotels & restaurants (29.06%), and banking, finance and insurance (24.48%). 37.2% of Bournemouth's resident population are employed full-time while 13.3% are employed part-time. An additional 7.1% full-time workers are self-employed, 3.1% are self-employed part-time. Full-time students with jobs account for 5.3% and 3.8% are unemployed. 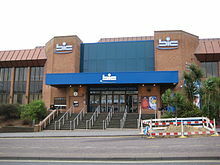 Bournemouth International Centre (BIC) is a national conference and music venue in the town. Major venues for concerts include BIC, Pavilion Theatre and O2 Academy. Built in 1984, the BIC is also a popular place for party political conferences and has been used by all three major political parties. Its four auditoria make it the largest venue on the south coast. The O2 and Pavilion are older and are both Grade II listed buildings. The O2, which opened in 1895 as the Grand Pavilion Theatre, was initially used as a circus and later for music hall theatre. The Pavilion opened in 1929 as concert hall and tea room while also providing a venue for the municipal orchestra. It continues to provide traditional entertainment today, presenting West End stage shows, ballet and operas. Bournemouth has more than 200 listed buildings, mainly from the Victorian and Edwardian eras, including three grade I churches; St Peter's, St Clement's and St Stephen's. The Russell-Cotes Museum is a Grade II* listed, villa completed in 1901. It houses artefacts and paintings collected by the Victorian philanthropist Merton Russell-Cotes and his wife during their extensive travels around the world. The four art galleries display paintings by William Powell Frith, Edwin Landseer, Edwin Long, William Orchardson, Arthur Hughes, Albert Moore and Dante Gabriel Rossetti. It was Russell-Cotes who successfully campaigned to have a promenade built; it runs continuously along the Bournemouth and Poole shoreline. The Lower, Central and Upper Gardens are Grade II* public parks, leading for several miles down the valley of the River Bourne through the centre of the town to the sea. Bournemouth has a further 425 acres (172 ha) of parkland. Initially serving to compensate for the loss of common rights after common land was enclosed in 1802, it was held in trust until 1889 when ownership passed to Bournemouth Corporation and the land became five public parks: King's Park, Queen's Park, Meyrick Park, Seafield Gardens and Redhill Common. One of Bournemouth's most noted cultural institutions is Bournemouth Symphony Orchestra which was formed in 1893 under Dan Godfrey. It became the first municipal orchestra in the country when in 1896, Bournemouth Borough Council took control and Godfrey was appointed musical director and head of the town's entertainments. Originally playing three concerts a day during the summer season, in the great glass palm house known as the Winter Gardens; the orchestra is now based in Poole and performs around 130 concerts a year across Southern England. Bournemouth is currently host to a number of festivals. Bournemouth Food and Drink Festival is a ten-day event which combines a market with live cookery demonstrations. The Arts by the Sea Festival is a mix of dance, film, theatre, literature, and music which was launched in 2012 by the local university, the Arts University Bournemouth, and is set to become an annual event. The Bourne Free carnival is held in the town each year during the summer. Initially a gay pride festival, it has become a celebration of diversity and inclusion. Since 2008, Bournemouth has held its own air festival over four days in August. This has featured displays from the Red Arrows as well as appearances from the Yakovlevs, Blades, Team Guinot Wing-Walkers, Battle of Britain Memorial Flight including Lancaster, Hurricane, Spitfire and also the last flying Vulcan. The festival has also seen appearances from modern aircraft such as the Eurofighter Typhoon. The air festival attracts up to a million people over the four-day event. 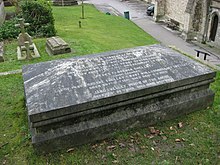 The grave of writer Mary Shelley and her parents including Mary Wollstonecraft in St. Peter's Church, Bournemouth. Percy Florence Shelley lived at Boscombe Manor; a house he had built for his mother, Mary Shelley, the writer and author of the Gothic horror novel, Frankenstein. Mary died before the house was completed but she was buried in Bournemouth, in accordance with her wishes. The family plot in St Peter's churchyard also contains her parents William Godwin and Mary Wollstonecraft, and the heart of her husband, Percy Bysshe Shelley. Robert Louis Stevenson wrote The Strange Case of Dr. Jekyll and Mr. Hyde and most of his novel Kidnapped from his house "Skerryvore" on the west cliff, Westbourne. Vladimir Chertkov established a Tolstoyan publishing house with other Russian exiles at Tuckton, and under the 'Free Age Press' imprint, published the first edition of several works by Leo Tolstoy. Author Bill Bryson worked for a time with the Bournemouth Echo newspaper and wrote about the town in his 1995 work Notes from a Small Island. Bournemouth has three Grade I listed churches, St Peter's and St Stephen's in the town centre and St Clement's in Boscombe. St Peter's was the town's first church, completed in 1879 and designed by George Edmund Street. In his book, England's Thousand Best Churches, Simon Jenkins describes the chancel as "one of the richest Gothic Revival interiors in England", while the 202 feet (62 m) spire dominates the surrounding skyline. When the architect, John Loughborough Pearson, designed St Stephen's his aim was to,"bring people to their knees". It has a high stone groined roof, twin aisles and a triforium gallery, although the tower lacks a spire. The Grade II listed entrance to Boscombe Pier. "Britain's coolest pier" according to fashion designer Wayne Hemingway. The borough has two piers: Bournemouth Pier, close to the town centre, and the shorter but architecturally more important Boscombe Pier. Designed by the architect Archibald Smith, Boscombe Pier opened in 1889 as a 600 feet (180 m) structure which was extended to 750 feet (230 m) in 1927 when a new head was constructed. Added in 1958, the boomerang-shaped entrance kiosk and overhanging concrete roof is now a Grade II listed building. In 1961 a theatre was added but this was demolished in 2008 when the rest of the pier was renovated. In 2009, fashion designer Wayne Hemingway described Boscombe Pier as "Britain's coolest pier". It was also voted Pier of the Year 2010 by the National Piers Society. In 1856, Bournemouth Pier was a simple, wooden jetty. This was replaced by a longer, wooden pier five years later, and a cast iron structure in 1880. Two extensions to the pier in 1894 and 1905, brought the total length to 305 metres (1,001 feet). After World War II, the structure was strengthened to allow for the addition of a Pier Theatre, finally constructed in 1960. This survived until the 2000s when it was turned into a climbing adventure centre. Between 1979 and 1981, a £1.7 million redevelopment programme, saw a great deal of reconstruction work, and the addition of a large two-storey, octagonal-shaped entrance building. Built as the Mont Dore Hotel in 1881, Bournemouth Town Hall was designated a Grade II listed building in 2001. Designed by Alfred Bedborough in the French, Italian and neo-classical styles, the foundation stone was laid by King Oscar II of Sweden and Norway and the hotel opened in 1885. The buff brick exterior features Bath stone dressings and terracotta friezes. The main entrance is sited within a projected façade that reaches to the eaves and is topped with a pediment, while above sits a belvedere with turrets and a pavilion roof. During the First World War the hotel was used as a hospital for British and Indian soldiers and after as a convalescent home. It never opened as a hotel again and was purchased by Bournemouth Borough Council in 1919. Built in the Art Deco style in 1929, situated close to the seafront, the Pavilion Theatre was at the time considered to be the greatest ever municipal enterprise for the benefit of entertainment. Built from brick and stone, the frontage features square Corinthian columns. Still a popular venue, it is today a Grade II listed building. The town has a professional football club, AFC Bournemouth, known as the Cherries, which was promoted to the Championship in 2013 and Premier League in 2015. AFC Bournemouth play at Dean Court near Boscombe in Kings' Park, 2 miles (3 km) east of the town centre. Bournemouth Rugby Club, which competes in the National League Division Two South, has its home at the Bournemouth Sports Club, next to Bournemouth Airport, where it hosts an annual Rugby sevens tournament and festival. Oakmeadians RFC is the oldest RFU Accredited Rugby Club in Bournemouth, established in 1963.They train and play at Meyrick Park competing in the South West Division. Bournemouth Cricket Club also plays at Bournemouth Sports Club and is reported to be one of the biggest cricket clubs in the country. Its first team plays in the Southern Premier League.Dean Park is a former county cricket ground, once home to Hampshire County Cricket Club and later Dorset County Cricket Club. Today it is a venue for university cricket. The BIC has become a venue for a round of the Premier League Darts Championship organised by the Professional Darts Corporation. The Bournemouth Rowing Club, is the town's coastal rowing club. Established in 1865 as Westover and Bournemouth Rowing Club, it is reported to be the oldest sporting association in the county. The club regularly competes in regattas organised by the Hants and Dorset Amateur Rowing Association which take place on the South Coast of England between May and September. Other watersports popular in Poole Bay include sailing and surfing, and there are a number of local schools for the beginner to learn either sport. Bournemouth has the third largest community of surfers in the UK and in 2009 an artificial surf reef, one of only four in the world, was constructed there. The reef failed to deliver the promised grade 5 wave, suffered a series of delays and ran over budget, finally costing £3.2 million. The principal route to the town centre is the A338 spur road, a dual carriageway that connects to the A31 close to the Hampshire border. The A31 joins the M27 at Southampton and from there the M3 to London and the A34 to the Midlands and the North can be accessed. The main road west is the A35 to Honiton in Devon which runs through the South East Dorset Conurbation and continues east as far as Southampton, albeit as a non-primary route. The A350 in the neighbouring borough of Poole provides the only northern route out of the conurbation. National Express coaches serve Bournemouth Travel Interchange & Bournemouth University. There are frequent departures to London Victoria Coach Station and Heathrow and Gatwick Airports. Local buses are provided mainly by two companies, Wilts & Dorset, the former National Bus Company subsidiary and now owned by the Go-Ahead Group, and Yellow Buses, the former Bournemouth Council-owned company and successors to Bournemouth Corporation Transport, which began operating trams in 1902. Other operators serving the town include Damory Coaches and the Shaftesbury & District bus company. Bournemouth railway station, built in 1885, with a replica Victorian iron and glass roof. There are two stations in the town, Bournemouth railway station and Pokesdown railway station to the east. Parts of western Bournemouth can also be reached from Branksome station. All three stations lie on the South Western Main Line from Weymouth to London Waterloo. South Western Railway operates a comprehensive service along this line, which also serves Southampton, Winchester and Basingstoke to the east, and Poole, Wareham, and Dorchester South to the west. Before its closure in 1966, Bournemouth was also served by the Somerset and Dorset Joint Railway which provided direct access to Somerset and the Midlands. 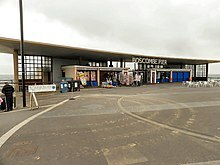 Originally an RAF airfield, Bournemouth Airport was transferred to the Civil Aviation Authority in 1944 and was the UK's only intercontinental airport before the opening of Heathrow Airport in 1946. Acquired by the Manchester Airports Group in 2001, the airport underwent a £45 million phased expansion programme between 2007 and 2011. Situated near the village of Hurn in Christchurch, Dorset, the airport is 7 kilometres (4.3 mi) from Bournemouth town centre and serves around 600,000 passengers annually. There are direct flights to 23 international destinations in nine countries: Cyprus, Finland, Greece (3 destinations), Italy (4), Malta, Portugal, Spain (10), Switzerland and Turkey. The Bournemouth local education authority was first set up in 1903 and remained in existence until local government was reorganised in 1974 when Bournemouth lost its County Borough status and became part of the county of Dorset. Under the later reforms of 1997, Bournemouth became a unitary authority and the Bournemouth local education authority was re-established. The local council operates a two-tier comprehensive system whereby pupils attend one of the 26 primary schools in the borough before completing their education at secondary school. Bournemouth is one of the minority of local authorities in England still to maintain selective education, with two grammar schools (one for boys, one for girls) and ten secondary modern/comprehensive schools. There are also a small number of independent schools in the town, and a further education college. Bournemouth has two universities: Bournemouth University and Arts University Bournemouth, both of which are located across the boundary in neighbouring Poole. They are also home to AECC University College (formally known as Anglo European College of Chiropractic), which is located on Parkwood Road in Bournemouth. In 2012, 60.7% of the borough's school leavers gained 5 GCSEs of grade C or above. This was slightly better than the national average of 59.4% and above the average for the rest of Dorset, with 58.8% of pupils from the local authority of Poole, and 54.1% from the remainder of the county, managing to do likewise. The 2011 census revealed that 57.1% of the borough's population are Christian. With all other religions combined only totalling 4.7%, Christianity is by far the largest religious group. 40% of the borough falls within the Church of England Diocese of Salisbury. The remainder, to the east, belongs to the Diocese of Winchester. The Roman Catholic Diocese of Portsmouth incorporates most of Bournemouth with the exception of two small parishes to the west which are covered by the Diocese of Plymouth. The borough has several notable examples of Victorian church architecture including the previously mentioned St. Peter's, the churchyard of which contains the grave of the author Mary Shelley; St Stephen's Church, completed in 1898 for services under the influence of the Oxford Movement and St Clement's, one of the first churches to be designed by John Dando Sedding, built in Boscombe in 1871. To serve a rapidly expanding population a third church was built in the town centre in 1891. St Augustin's church was commissioned by Henry Twells who was 'priest-in-charge' there until 1900. The largest church in the town is the Richmond Hill St Andrew's Church, part of the United Reformed Church. Built in 1865 and enlarged in 1891, it has a seating capacity of 1,100 and is unusually ornate for a non-conformist church. Few purpose-built places of worship exist in the borough for faiths other than Christianity, although with a higher proportion of Jewish residents than the national average, there are three synagogues.Chabad-Lubavitch of Bournemouth is a branch of the worldwide movement. The Bournemouth Reform Synagogue, formerly known as Bournemouth New Synagogue, is a Reform Jewish synagogue with over 700 members. There is also the architecturally notable Bournemouth Hebrew Congregation synagogue built in 1911 with an Art Nouveau take on the Moorish Revival style. There are also two Christadelphian meeting halls in the town. The Bournemouth Islamic Centre provides information, support and a place of worship for the Islamic community. There is also a mosque in the town. 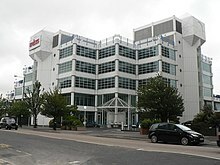 Although it has a significant presence in Bournemouth town centre, Bournemouth University's main campus is located in Poole, on the boundary with Bournemouth. Bournemouth Airport is located near Hurn in the borough of Christchurch, and was originally named RAF Hurn. The Bournemouth Symphony Orchestra is now based in Poole. A number of (subsequently) famous people came from Bournemouth. Tony Hancock  lived for most of his early life in hotels in Bournemouth run by his parents. A number of TV actors came from Bournemouth, including Juliette Kaplan  from the BBC comedy Last of the Summer Wine, Ray Lonnen  from the series The Sandbaggers (1978–80), Alison Newman, actress who played Hazel Bailey  in Footballers' Wives and DI Samantha Keeble  in EastEnders. Jack Donnelly (born 1985) actor, played the role of Jason  in the BBC series Atlantis and Sophie Rundle (born 1988) actress, portrayed Ada Shelby  in the BBC One series Peaky Blinders and Ben Hardy (born 1991) actor, played Peter Beale  in the BBC soap opera EastEnders. Authors Radclyffe Hall (1880–1943)  poet and author, who wrote The Well of Loneliness a groundbreaking work in lesbian literature came from Bournemouth and Dilys Powell CBE (1901–1995)  journalist, film critic of The Sunday Times for over fifty years went to school there. Patrick Ensor (1946–2007)  editor of Guardian Weekly from 1993 to 2007 also came from Bournemouth. Bournemouth has been home to a number of musicians, including Max Bygraves OBE (1922–2012)  comedian, singer, actor and variety performer. 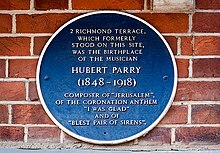 The composer Sir Hubert Parry (1848-1918) was born in Bournemouth. One of Britain's most prolific composers of choral music he is probably best known for his setting to William Blake's words of Jerusalem. The rock band King Crimson included many musicians from Bournemouth  including brothers Michael Giles (drums) and Peter Giles (bass). Bournemouth has been the home of sporting world champions: Freddie Mills (1919–1965), who won the World Light Heavyweight title in 1948. Another famous sportsman, the athlete Charles Bennett (1870–1948), lived in the town after he retired. Bennett, was the first British track and field athlete to become Olympic Champion, winning two gold medals and a silver at the Paris Games in 1900. The tennis player and Wimbledon Championships winner Virginia Wade OBE was born in Bournemouth. Three recipients of the Victoria Cross came from Bournemouth. Frederick Charles Riggs VC MM (1888–1918), Cecil Noble VC (1891–1915), and Lieutenant Colonel Derek Anthony Seagrim VC (1903–1943), Three flying aces came from Bournemouth too, Captain Keith Muspratt MC (1897–1918), Captain Robert A. Birkbeck DFC (1898–1938), and Flight Lieutenant Charles John Sims DFC (1899–1929). And a distinguished resident of Bournemouth was Sir Donald Coleman Bailey, OBE (1901–1985) a civil engineer who invented the Bailey bridge. Bailey was knighted in 1946 for his bridge design when he was living quietly in Southbourne in Bournemouth. The following people and military units have received the Freedom of the Borough of Bournemouth. Rt Hon Lord Roberts of Kandahar: 7 October 1902. Rt Hon Sir Winston Churchill. ^ In accordance with World Meteorological Organization (WMO) recommendations, the Met Office maintains long-term averages of the UK climate, based on standard 30-year periods. The latest 30-year period is for 1981–2010. ^ Agriculture data is excluded from ONS figures at a sub-regional level, therefore an estimate has been made using DEFRA 2010 data. As there is little farming within the Bournemouth area, this has a minimal effect. ^ A. McKinstry, The Village of Tuckton, 35,000 BC - 1926 (Christchurch: Natula Publications, 2015), p. 12. ^ Page, William, ed. (1912). "The liberty of Westover: with Holdenhurst and Bournemouth". A History of the County of Hampshire. 5. Constable & Co. pp. 133–137. ^ Stannard, Michael (1999). The Makers of Christchurch: A Thousand Year story. Natula Publications. p. 223. ISBN 978-1-897887-22-6. ^ John Walker (March 2010). "The Beginnings of Bournemouth". Dorset Life Magazine. Retrieved 23 October 2012. ^ a b c "Bournemouth, Garden by the Sea" (PDF). Diamond Jubilee Civic Honours Bid. Bournemouth County Council. May 2011. p. 3. Archived from the original (PDF) on 20 June 2013. Retrieved 9 September 2012. ^ a b c "History of Bournemouth Pier". National Piers Society. 2012. Retrieved 12 October 2012. ^ "South Coast alert after attack on resort: Bomb found under Bournemouth". 13 August 1993. Retrieved 19 August 2016. ^ a b c Steven Morris (20 January 2010). "England's most hated building to be demolished". The Guardian. Retrieved 10 February 2013. ^ "Work to lower height of Dorset's Imax building starts". BBC Dorset. 18 March 2011. Retrieved 10 February 2013. ^ "Cinema to be demolished to restore famous view". The Telegraph. 21 January 2010. Retrieved 10 February 2013. ^ Slade, Darren (14 March 2012). "Bournemouth loses bid for city status". Bournemouth Echo. Retrieved 6 April 2012. ^ "History of Bournemouth". Bournemouth County Council. Archived from the original on 18 February 2012. Retrieved 13 December 2011. ^ "Local Elections 2011". Bournemouth Borough Council. Archived from the original on 7 May 2010. Retrieved 23 August 2013. ^ "Final recommendations on the future electoral arrangements for Bournemouth" (PDF). Report to the Secretary of State for Transport, Local Government and the Regions. Local Government Commission for England. December 2001. p. vii. Archived from the original (PDF) on 4 June 2012. Retrieved 27 September 2013. ^ "Bournemouth at a glance". 2011 council election results. BBC. Retrieved 24 August 2013. ^ "Mayor making and annual civic service". Bournemouth Borough Council. Archived from the original on 3 October 2013. Retrieved 24 August 2013. ^ "The Mayor of Bournemouth". www.bournemouth.gov.uk. Retrieved 31 January 2019. ^ "Find your MP". UK Parliament. Retrieved 24 August 2013. ^ "Bournemouth West parliamentary constituency - Election 2017". Retrieved 31 January 2019. ^ "Bournemouth East parliamentary constituency - Election 2017". Retrieved 31 January 2019. ^ Straight line distances from: Daft Logic. "Google Maps Distance Calculator". Retrieved 30 July 2010. ^ "Rural Atlas". Disadvantaged Districts. Department of Environment, Food and Rural Affairs. Archived from the original on 30 August 2011. Retrieved 27 November 2012. ^ a b "A picture of Bournemouth – Overview" (PDF). Wards and ward profiles. Bournemouth Borough Council. p. 3. Archived from the original (PDF) on 3 October 2013. Retrieved 27 November 2012. ^ Stuart Clarke. "River Path". The Stour in Bournemouth. England in Particular. Archived from the original on 16 February 2012. Retrieved 27 November 2012. ^ "About the Bourne Stream". Bourne Stream Partnership. 2012. Retrieved 5 September 2013. ^ a b "Final First Detailed Proposals for RSS Sub-Regional Policies for South East Dorset". South East Dorset Joint Study Area Reports. Bournemouth, Poole and Dorset County Councils. November 2005. p. 2. Archived from the original on 18 February 2012. Retrieved 18 November 2012. ^ "A picture of Bournemouth – Overview" (PDF). Wards and ward profiles. Bournemouth Borough Council. p. 2. Archived from the original (PDF) on 3 October 2013. Retrieved 7 September 2013. ^ "Geology of Britain Viewer". British Geological Survey. Retrieved 27 September 2013. ^ Wightman, R. (1983). Portrait of Dorset. London: Robert Hale. pp. 22–25. ISBN 0-7090-0844-9. ^ "Turbary Common". Dorset For You. 2011. Retrieved 29 November 2012. ^ "Turbary Common Local Nature Reserve". Bournemouth Borough Council. 2011. Archived from the original on 9 September 2012. Retrieved 29 November 2012. ^ "Dorset and East Devon Coast" (web page). UNESCO World Heritage Centre. 2001. Retrieved 16 March 2015. ^ "Seafront Strategy 2007–2011" (PDF). Bournemouth Borough Council. p. 10. Retrieved 7 September 2013. ^ "Hengistbury Head Management Plan" (PDF). Bournemouth Borough Council. 2005. pp. 15 & 27. Retrieved 4 December 2012. ^ "Hengistbury Head and its Antiquities". Pastscape. English Heritage. 2005. Retrieved 4 December 2012. ^ "Mean Temperature Annual Average". Met Office. 2010. Retrieved 25 August 2013. ^ a b "Hurn Climatic Averages 1981–2010". Met Office. Retrieved 23 December 2012. ^ "Mean Annual Rainfall Average". Met Office. 2010. Retrieved 25 August 2013. ^ "1990 temperature". KNMI. Retrieved 25 August 2013. ^ "1963 temperature". KNMI. Retrieved 25 August 2013. ^ "2010 temperature". UKMO. Retrieved 25 August 2013. ^ "Synop Report - Bournemouth Airport February 2019". ^ a b "BOURNEMOUTH LOCAL PLAN: CORE STRATEGY Bournemouth Borough Council Adopted October 2012" (PDF). www.bournemouth.gov.uk. ^ a b c "Religious group, local authorities in England and Wales". 2011 Census. Office for National Statistics. Retrieved 7 April 2013. ^ "Male usual resident population by five-year age group, local authorities in the United Kingdom". 2011 Census. Office for National Statistics. Retrieved 6 April 2013. ^ "Female usual resident population by five-year age group, local authorities in the United Kingdom". 2011 Census. Office for National Statistics. Retrieved 6 April 2013. ^ "Age structure, local authorities in England and Wales". 2011 Census. Office for National Statistics. Retrieved 6 April 2013. ^ a b "Population trends in Bournemouth" (PDF). Bournemouth Borough Council. October 2012. Retrieved 21 April 2013. ^ "Ethnic group, local authorities in England and Wales". 2011 Census. Office for National Statistics. Retrieved 7 April 2013. ^ "Highest qualification, local authorities in England and Wales". 2011 Census. Office for National Statistics. Retrieved 15 April 2013. ^ "Population". A Vision of Britain Through Time. Retrieved 25 April 2013. ^ "Historical population of Bournemouth". A Vision of Britain Through Time. Retrieved 16 April 2013. ^ a b "Health and Wellbeing in Bournemouth: Strategic Assessment" (PDF). Joint Strategic Needs Assessment. Bournemouth Borough Council. 2012. Retrieved 21 April 2013. ^ a b c "Key Facts – Economy". Dorset For You. 2011. Retrieved 7 September 2013. ^ "Economy". Bournemouth Statistics. Bournemouth Borough Council. 2011. Archived from the original on 2 May 2013. Retrieved 23 February 2013. ^ "Economic Performance, State of the South West 2011". South West Observatory. 2011. Archived from the original on 5 May 2013. Retrieved 10 April 2013. ^ a b c "Current Local Economic Overview" (PDF). Bournemouth Economic Bulletin. Bournemouth Borough Council. February 2012. Archived from the original (PDF) on 20 June 2013. Retrieved 25 February 2013. ^ a b c Business Register and Employment Services (2011). "Employment by Sector" (PDF). Bournemouth Statistics – Economy. Bournemouth Borough Council. Archived from the original (PDF) on 20 June 2013. Retrieved 29 March 2013. ^ "Bournemouth" (PDF). Value of Tourism. South West Research Company. 2011. Archived from the original (PDF) on 13 May 2013. Retrieved 27 February 2013. ^ "Economy Tourism Scrutiny Panel Minutes" (PDF). Bournemouth Borough Council. 5 October 2011. Archived from the original (PDF) on 29 November 2014. Retrieved 10 March 2013. ^ "RNLI: Bournemouth West Beach". Archived from the original on 8 October 2015. Retrieved 16 January 2016. ^ a b Rebecca Wearn (10 January 2013). "Bournemouth shines light on night time economy". BBC. Retrieved 28 March 2013. ^ a b "Statement of Licensing Policy" (PDF). Bournemouth Borough Council. 1 March 2011. Retrieved 12 March 2013. ^ "Economic activity, local authorities in England and Wales". 2011 Census. Office for National Statistics. Retrieved 13 April 2013. ^ "Centre may be shut over Christmas". BBC. 1 December 2005. Retrieved 12 March 2013. ^ "Bournemouth, Garden by the Sea" (PDF). Diamond Jubilee Civic Honours Bid. Bournemouth County Council. May 2011. pp. 9 & 10. Archived from the original (PDF) on 20 June 2013. Retrieved 9 September 2012. ^ "Bournemouth's Stag Culture". BBC Dorset. 26 October 2012. Retrieved 11 December 2012. ^ "Bournemouth happiest town in UK". BBC News. 8 March 2007. Retrieved 6 September 2007. ^ "Cinemas and theatres". Dorset For You. Dorset County Council. Retrieved 21 May 2011. ^ "Bournemouth venue marks 25 years". BBC Dorset. Retrieved 20 December 2012. ^ "About the BIC". BIC and Pavilion Theatres. Archived from the original on 23 January 2013. Retrieved 23 May 2015. ^ "About the O2 Academy". Academy Music Group. Retrieved 20 December 2012. ^ "The Lively Old Lady". Dorset Life Magazine. Retrieved 20 December 2012. ^ a b c d "Bournemouth's listed buildings" (PDF). Bournemouth County Council. Archived from the original (PDF) on 20 June 2013. Retrieved 8 September 2012. ^ "Background". Russell-Cotes Art Gallery and Museum. 2008. Archived from the original on 5 January 2013. Retrieved 4 January 2013. ^ "The collections". Russell-Cotes Art Gallery and Museum. 2008. Archived from the original on 5 January 2013. Retrieved 5 January 2013. ^ "Bournemouth, Garden by the Sea" (PDF). Diamond Jubilee Civic Honours Bid. Bournemouth County Council. May 2011. p. 2. Archived from the original (PDF) on 20 June 2013. Retrieved 9 September 2012. ^ Physical Environment: Land Use Survey 2005 Published with the 2011 census. ^ "Orchestra". Bournemouth Symphony Orchestra. Archived from the original on 4 March 2012. Retrieved 25 August 2009. ^ Findley, Nick (1 July 2012). "Bournemouth Food and Drink Festival is hot stuff". Dorset Echo. Retrieved 29 January 2013. ^ "Bournemouth Arts Festival by the Sea". Official Tourist Guide. Bournemouth Borough Council. Retrieved 29 January 2013. ^ "AUCB helps launch Arts by the Sea Festival". The Arts University College at Bournemouth. Archived from the original on 19 January 2013. Retrieved 29 January 2013. ^ "Bournemouth pride parade award is tribute to organiser". BBC News Dorset. 6 July 2011. Retrieved 29 January 2013. ^ "Bournemouth Air Festival 2008". Bournemouth Echo. 2008. Retrieved 6 January 2013. ^ "Plane fascinating – Bournemouth Air Festival factfile". Bournemouth Echo. 2012. Archived from the original on 1 June 2012. Retrieved 6 January 2013. ^ "Bournemouth Air Festival 2012". Bournemouth Echo. 2012. Archived from the original on 16 October 2012. Retrieved 6 January 2013. ^ "One million people at air show". BBC Dorset. 2009. Retrieved 29 September 2013. ^ Delahave, Ernst (22 May 2010). "Biography of Paul Verlaine". The Left Anchor. Archived from the original on 12 May 2013. Retrieved 11 January 2013. ^ Legg, Rodney (November 2009). "Tolkien in Bournemouth and Dorset". Dorset Life Magazine. Retrieved 12 January 2013. ^ "Mary Shelley's Bournemouth legacy". BBC Dorset. 4 February 2010. Retrieved 12 January 2013. ^ "Notes from a Small Island | Bill Bryson | Chapter Seven". Read Free Online Publishing. 8 May 1947. Retrieved 26 March 2013. ^ "Who We Are". St Peter's Church, Bournemouth. Retrieved 29 July 2012. ^ "Internal Architecture". St Stephen's Church, Bournemouth. Retrieved 29 July 2012. ^ "External Architecture". St Stephen's Church, Bournemouth. Retrieved 29 July 2012. ^ a b "Boscombe pier". National Piers Society. 2013. Retrieved 3 July 2013. ^ "Neck or Entrance building at Boscombe Pier". National Heritage List for England. English Heritage. 2011. Retrieved 3 July 2013. ^ "Britain's coolest pier". Bournemouth Borough Council. 2011. Archived from the original on 3 October 2013. Retrieved 3 July 2013. ^ a b "The Town Hall". National Heritage List for England. English Heritage. 2011. Retrieved 17 September 2013. ^ a b "Bournemouth Pavilion". Local Histories. BBC Dorset. 2009. Retrieved 8 September 2012. ^ "Bournemouth Balloon Facts". S&D Leisure. 2012. Archived from the original on 20 August 2013. Retrieved 8 July 2013. ^ "About Us". S&D Leisure. 2012. Archived from the original on 20 August 2013. Retrieved 8 July 2013. ^ "Bournemouth balloon axed after damage". BBC News. 2017. ^ "Cherries Open Top Bus Tour". Bournemouth Echo. 2013. Retrieved 10 July 2013. ^ "New sponsor deal for Cherries stadium". Bournemouth Echo. 2012. Archived from the original on 11 November 2013. Retrieved 16 July 2013. ^ "Rugby Sevens". 2012. Retrieved 17 July 2013. ^ "National League Tables". National Clubs Association. 2012. Retrieved 17 July 2013. ^ "Bournemouth Rugby Club". Pitchero Rugby Union Network. 2013. Archived from the original on 25 September 2013. Retrieved 7 September 2013. ^ "Oakmeadians RFC Rugby Club Website". Oakmeadians RFC Rugby Club. 17 October 2017. Retrieved 17 October 2017. ^ "Bournemouth cricket club (about)". Bournemouth Cricket Club. Retrieved 9 August 2013. ^ "Dean Park Cricket Ground". Bournemouth University. Retrieved 9 August 2013. ^ "Premier League Darts 2013 Dates and Venues". Live Darts. Retrieved 9 August 2013. ^ "About". Westover and Bournemouth Rowing Club. 2013. Retrieved 10 August 2013. ^ "Watersports in Bournemouth". Watersporty. Retrieved 7 September 2013. ^ "Boscombe's Surf Reef Project". British Broadcasting Corporation. 2 November 2009. Retrieved 23 July 2011. ^ "Rectifying Boscombe's Surf Reef". Daily Echo. Retrieved 23 July 2011. ^ "Boscombe surf reef 'should be demolished'". BBC Dorset. Retrieved 29 September 2013. ^ "A338 Bournemouth Spur Road – Major Scheme Business Case". Dorset for You. 2013. Retrieved 15 June 2013. ^ "Roader's Digest – A35". SABRE. 2012. Retrieved 15 June 2013. ^ "Protest pensioner halts A35 traffic in Dorset". BBC News. 2013. Retrieved 14 June 2013. ^ "North Dorset MP, Robert Walter, to the House". Hansard. 2003. Retrieved 15 June 2013. ^ "Services to Bournemouth (Coach Station Section)". National Express. 2013. Retrieved 15 June 2013. ^ a b c "Public Transport". Bournemouth Borough Council. 2013. Archived from the original on 23 May 2013. Retrieved 15 June 2013. ^ "Yellow Buses – History". Yellow Buses. 2013. Retrieved 16 June 2013. ^ "Getting Here". Bournemouth Official Tourist Guide. Retrieved 18 June 2013. ^ a b "South West Main Line, Route Utilisation Strategy" (PDF). Network Rail. 2006. Retrieved 26 June 2013. ^ "Route 3, South West Main Line" (PDF). Network Rail. 2008. Retrieved 27 June 2013. ^ "Somerset and Dorset Joint Railway History". Somerset and Dorset Joint Railway Trust. 2002. Archived from the original on 2 October 2013. Retrieved 29 September 2013. ^ "Our History". Bournemouth International Airport Limited. 2013. Archived from the original on 24 April 2011. Retrieved 30 September 2013. ^ "Bournemouth airports terminal on course". Bournemouth Echo. 2010. Retrieved 30 June 2013. ^ "Bourne Again – New terminal unveiled". Bournemouth International Airport Limited. 2013. Archived from the original on 27 May 2013. Retrieved 30 June 2013. ^ "Bournemouth Airport Facts & Figures". Bournemouth International Airport Limited. 2013. Archived from the original on 1 September 2013. Retrieved 26 June 2013. ^ "A Picture of Bournemouth" (PDF). Bournemouth Borough Council. 2011. pp. 11–12. Archived from the original (PDF) on 3 October 2013. Retrieved 21 November 2012. ^ "A Picture of Bournemouth" (PDF). Bournemouth Borough Council. 2011. p. 12. Archived from the original (PDF) on 3 October 2013. Retrieved 21 November 2012. ^ "A Picture of Bournemouth" (PDF). Bournemouth Borough Council. 2011. p. 13. Archived from the original (PDF) on 3 October 2013. Retrieved 21 November 2012. ^ "AECC University College". AECC University College. 5 September 2017. Retrieved 17 October 2017. ^ "We built a University College". AECC University College. 5 September 2017. Retrieved 17 October 2017. ^ "Regional Picture: GCSE Results 2012". BBC. 2013. Retrieved 16 September 2013. ^ "Frankenstein author Mary Shelley's Bournemouth legacy". BBC Dorset. 2012. Retrieved 29 July 2012. ^ "Origins". St Stephen's. Bournemouth Town Centre Parish. 2013. Retrieved 21 August 2013. ^ "Church of St Clement". Listed Buildings. English Heritage. 2013. Retrieved 21 August 2013. ^ "Who we are". St Augustin's. Bournemouth Town Centre Parish. 2013. Retrieved 21 August 2013. ^ "A Christian service at the heart of Bournemouth". Richmond Hill St. Andrews Church. 2013. Retrieved 22 August 2013. ^ "History". About Us. Richmond Hill St. Andrews Church. 2013. Retrieved 22 August 2013. ^ "Religion". Neighbourhood Statistics. Office for National Statistics. 2013. Retrieved 15 August 2013. ^ Ruth Pauline Goldschmidt-Lehmann (1973). "Anglo-Jewish Bibliography, 1937–1970". Jewish Historical Society of England. ^ David Soetendorp (2003). "A Generation Confronting the Loss of Community". 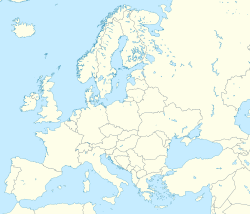 European Judaism. 36. ^ "Faith". BBC Dorset. 2012. Retrieved 23 August 2013. ^ "10 Reasons to Choose BU". Bournemouth University. 2013. Retrieved 22 September 2013. ^ "Contact Details". Cobham Aviation. Retrieved 22 September 2013. ^ "Bournemouth Bay Run". British Heart Foundation. 2014. Retrieved 22 September 2013. ^ "BSO Our Vision". Bournemouth Symphony Orchestra. Retrieved 22 September 2013. ^ a b Walker, John (2009). Bournemouth 1810-2010: Bicentennial Special. pp. C-4. ^ a b c "Dorset Twinning Association List". The Dorset Twinning Association. Archived from the original on 21 June 2012. Retrieved 1 August 2013. ^ "Partnerstädte der Stadt Luzern". Stadt Luzern (in German). Archived from the original on 21 June 2013. Retrieved 1 August 2013. ^ "Eddie Howe to be given Freedom of Bournemouth". BBC News. Retrieved 31 March 2019. ^ "Eddie Howe to receive Freedom of the Borough". Bournemouth.gov.uk. 25 February 2019. ^ "Local History - The Royal Hampshire Regiment Museum". Royalhampshireregiment.org. Retrieved 31 March 2019. Andrews, Ian; Henson, Frank (2004). Images of England – Bournemouth. Stroud, Glos: Tempus Publishing Ltd. ISBN 0-7524-3065-3. Ashley, Harry W.; Ashley, Hugh (1990). Bournemouth 1890–1990 (a brief history of Bournemouth over the last 100 years). Bournemouth: Bournemouth Borough Council. Cave, Paul (1986). A History of the Resort of Bournemouth. Southampton: Paul Cave Publications Ltd. ISBN 0-86146-039-1. Edwards, Elizabeth (1981). A History of Bournemouth. Chichester: Phillimore & Co Ltd. ISBN 0-85033-412-8. Emery, Andrew (2008). A History of Bournemouth Seafront. Stroud, Glos: Tempus Publishing Ltd. ISBN 978-0-7524-4717-9. Rawlings, Keith (2005). Just Bournemouth. Wimborne: Dovecote Press. ISBN 1-904349-39-0. Wikimedia Commons has media related to Bournemouth. 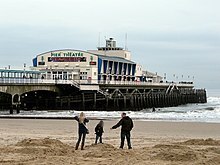 Wikivoyage has a travel guide for Bournemouth. Wikisource has the text of the 1911 Encyclopædia Britannica article Bournemouth.